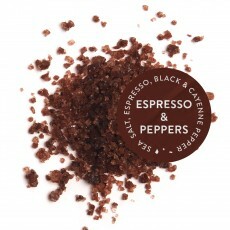 Our 100% Pure Amagansett Sea Salt blended with Espresso, Black Pepper & Cayenne Pepper. We got together with the folks at Tend Coffee in Shirley, NY and shared with them our desire to produce a dark brown salt blend. This salt, infused with freshly brewed espresso made from Certified Organic 100% Arabica specialty coffee beans, is the delicious result. With a striking, mocha color and aroma and a peppery finish, we use this blend on chicken, pork, seafood, and chocolate desserts. It really amps up flavors.